Virtual copies have become an essential part of image processing production, thanks to their great versatility and compact size. They make it possible to make multiple versions of an image without having to physically duplicate it. 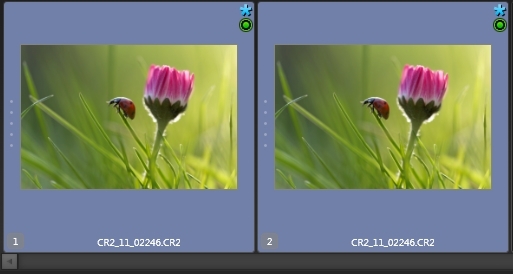 In this tutorial, you will learn how to create and manage virtual copies, and how to use them in your DxO Optics Pro workflow. Virtual copies let you create multiple versions of the same image without having to create multiple physical copies. In the early days of the digital era, the only way photographers could create several different versions of the same image was to duplicate the original as many times as necessary, and then to apply different processing to each one — for example, a photo of newlyweds to produce in black & white, or with sepia tones, or cropped in a particular ways, etc. The disadvantage of this method is that photographers would end up with many large duplicate files, to say nothing of more complicated file management, since each copy required a different name, and sometimes even had to be stored in a different directory. 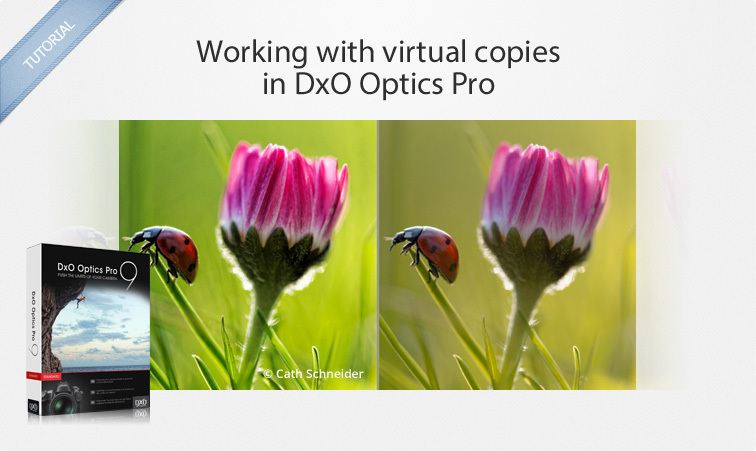 The arrival of the concept of non-destructive processing in software such as DxO Optics Pro has resulted in a different approach, thanks to the ability to save corrections and modifications as instructions, which also lets you create different versions of the same image (in other words, virtual copies). A virtual copy is simply a duplicate of the source image, but which exists only in the form of instructions and metadata. The two big advantages are size – a few kilobytes instead of several megabytes – and versatility, since you can create as many versions of the same image as you want without filling up your hard drive. Further, a virtual copy has the same look and feel as the original image in the software, and can be processed in the same way. 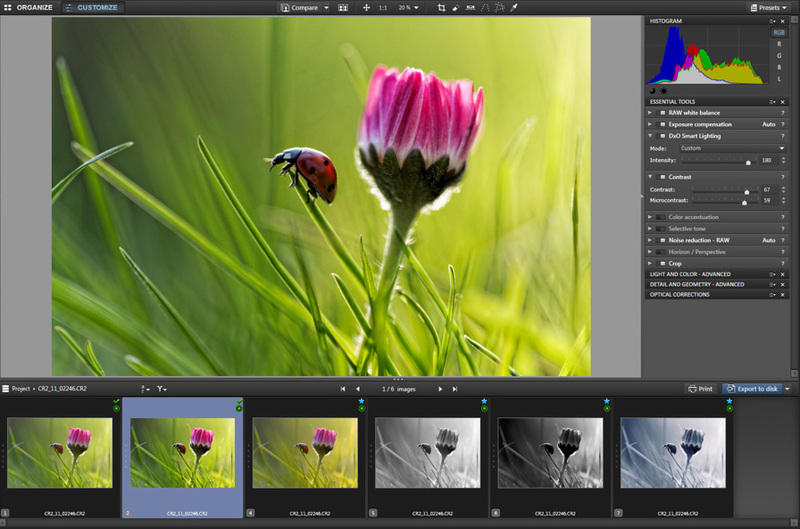 DxO Optics Pro lets you easily create, manage, and process an infinite number of virtual copies. Choose a RAW, TIFF, or JPEG image in the File browser. Right-click and choose Create a virtual copy in the context menu. The virtual copy will be displayed next to the source image, with a sequence number (no. 1 is reserved for the source image). You can create more virtual copies, either from the source image or from the first virtual copy. To create a virtual copy, right-click on a thumbnail. The virtual copies are automatically numbered sequentially (1, 2, 3, etc.). A virtual copy carries the same processing parameters and the same corrections as the source image, whether the source is the original image file or another virtual copy of it. A virtual copy retains the same settings as the source image. By selecting several images at once, you can create virtual copies for each one on the fly. Just as with original images, virtual copies can be assigned to Projects. Right-click on a virtual copy or on a selection of several virtual copies. 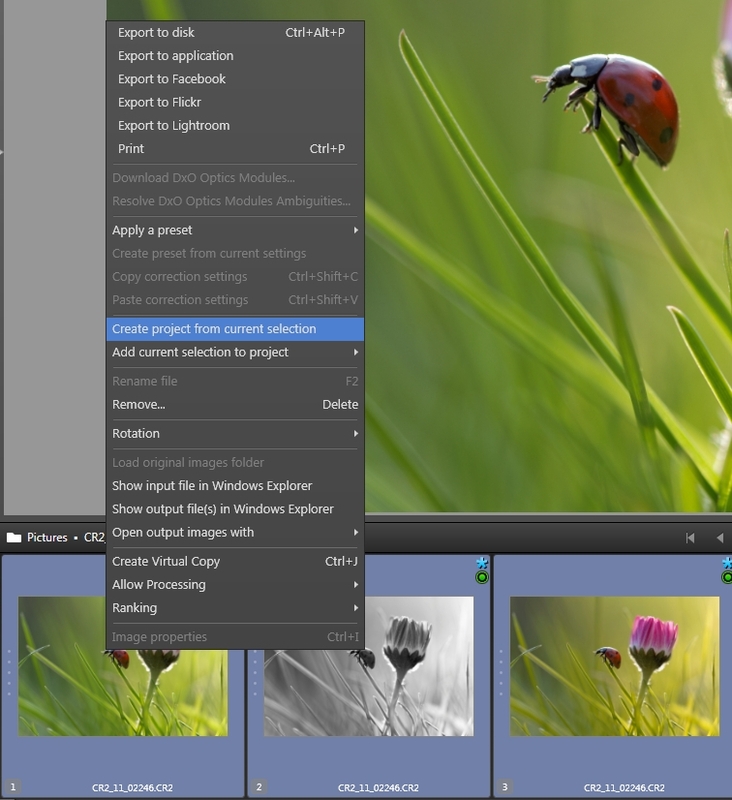 Select Create a project from the current selection from the context menu. A dialog box will promp you to enter a name for your project, which you will then be able to see in the Organize tab in the Source browser. Select Add the current selection to a project from the context menu. Select the destination Project from the sub-menu. Context menu for creating or adding to a Project. 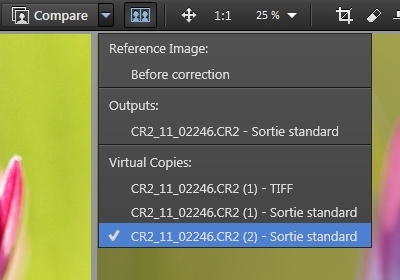 Deleting virtual copies behaves differently depending on whether you are in a Project or in the source image folder. Go into the source image folder. In the File browser, right-click on the virtual copy or the selection of virtual copies that you want to delete. Choose Delete in the context menu. In the File browser, right-click on the virtual copy or on the selection of virtual copies that you want to remove. Choose Delete from the context menu. A dialog box will ask you if you really want to delete the virtual copy from the current Project. Validate by clicking on Yes. Deleting a virtual copy from a Project does not mean that it is definitively deleted: you will still be able to find it in the source image folder. Removing a virtual copy from a Project. 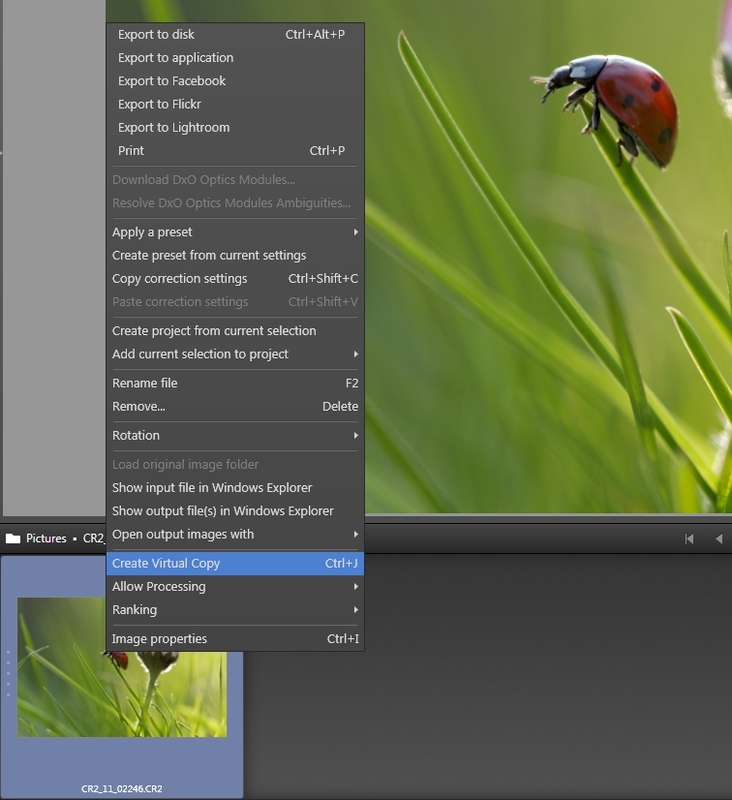 Virtual copies can be corrected, processed, and exported just like original images. 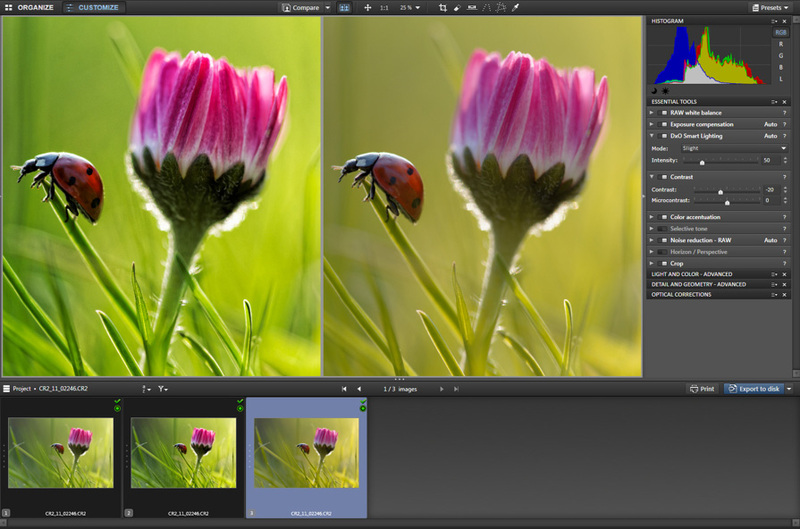 When you create a virtual copy, it retains the same corrections and settings as the original or source, whether that means simply the settings and corrections of the DxO Standard default preset applied when you open your image in DxO Optics Pro, or if you have applied other corrections or presets. When you correct or modify a virtual copy, the original is unaffected. And the corrections made to virtual copies also remain perfectly reversible. To see how virtual copies behave, try creating a half-dozen or so and apply a different preset to each one. Two versions of the same image. 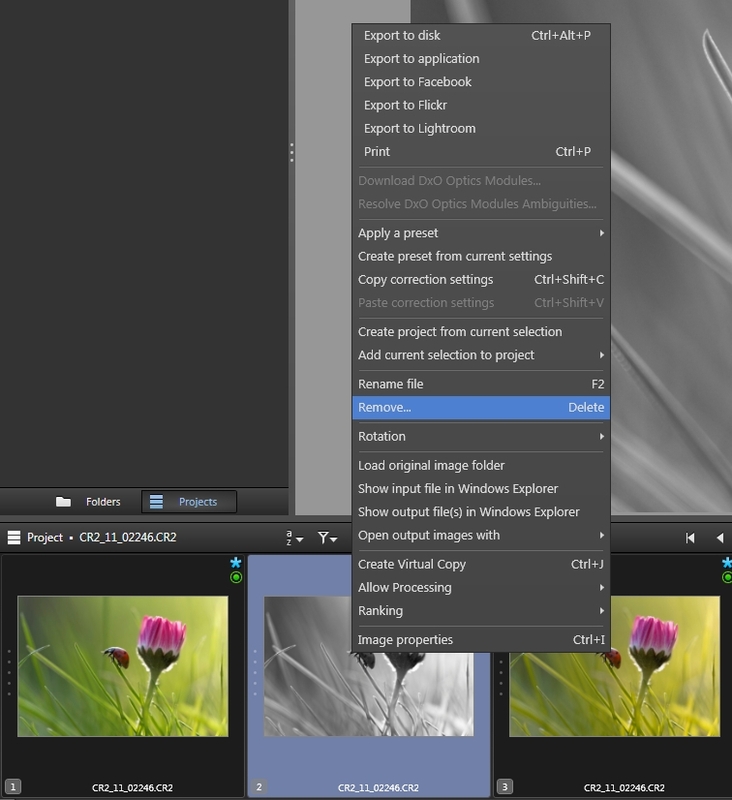 To apply your corrections and create a definitive file, you must export the image, whether it is the original or source image or a virtual copy: there is no difference at this level, and this applies to images exported to your hard drive, to another application, to Facebook, or to Flickr. An export underway for an original image and a virtual copy. If you have created a virtual copy of an image coming from Lightroom (see the tutorial here), it can also be exported back into the Adobe software when you select it along with the original image. In all cases, you can export a selection of original images and virtual copies. In the upper toolbar, click on the Side-by-side button. Select the virtual copy in the File browser. The original image is on the left; the virtual copy is on the right. To display another virtual copy on the right, click on its thumbnail in the File browser. 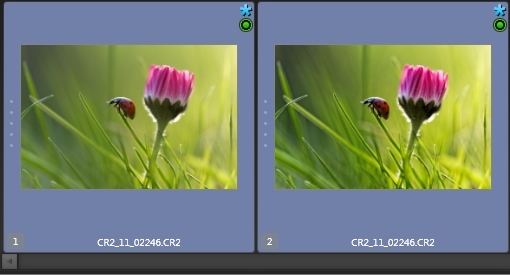 Selection menu for comparing images. Select one of the virtual copies in the File browser. The original image will be displayed on the left, and the selected virtual copy will appear on the right. Click on the small arrow to the right of the Side-by-side button. In the Virtual copies section of the drop-down menu, select the virtual copy that you want to use as the reference image. The reference image will be displayed on the left, and the selected virtual copy will be on the right. If you click on another virtual copy, it will be displayed on the right, and the reference image will remain the same. In the Windows version, you will first have to process and export the virtual copy before making any comparisons. Comparing two virtual copies with different processing settings.